School is out for your tweenagers, the weather is hot, and they have hours upon hours of free time to kill. With our Craft with Me collection of kits, you can keep them out of mischief and spend some family time together having fun, learning new skills and creating personalised and practical homewares. 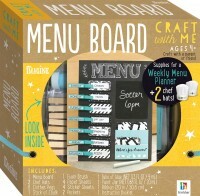 Spend a morning creating a fun family menu planner board with our Craft with Me: Menu Board kit that can be hung in the kitchen so everyone knows what's for dinner for the week and turn a chore into a fun, family-time cooking activity. Paint your clothespins so that they are ready for holding your weekly menu. Cut out the menu tabs, ready for writing your week's delicious dinners and attaching to the planner board with the clothespins. Store the excess ones in the pocket provided! Plan your week's menu; personalise your included chef's hat and come dinner time, get cooking! It's that easy. Ready for more crafting activities? 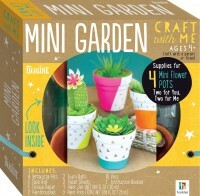 Enjoy an afternoon painting terracotta pots together with our Craft with Me: Mini Garden kit,either following the design directions or letting your creativity flow free. With your carefully or artistically painted pot you can either fold together the provided paper plants for an everlasting garden unaffected by the heat, or begin cultivating your child's green thumb through potting and caring for a plant of their own. 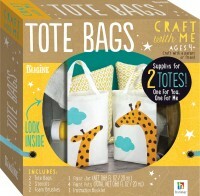 Or, sit in air-conditioned splendour while painting matching giraffe tote bags with our Craft with Me: Tote Bags kit. Your tweens will feel proud of their creation and happily take their bag with them, carrying their own belongings - or even yours! For activities your littlest kids will enjoy over and over again, our Craft-Struction: Pirate Ship and Doll House kits are bright and colourful 3D models made with sturdy cardboard that fits together easily. Not only will your kids enjoy building their new toy, but they will decorate and personalise their creations with stickers and get straight down to fun-filled adventures with the included punch-out, stand-up cardboard characters. Time to leave them to it, there's serious play time to be had! Keeping your kids entertained these school holidays doesn't need to be expensive or filled with exhausting excursions. You can make fun memories together, build confidence and invigorate imaginations right at home.